Colbert/Stewart event brings like-minded crowd to D.C.
Jon Stewart took aim at the media at his rally on Saturday. 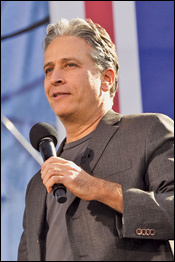 After an estimated crowd of hundreds of thousands descended on the National Mall for the Rally to Restore Sanity and/or Fear, inevitably Jon Stewart was asked at a post-event press conference just what could be next. Specifically, how did he think the media would react to the event -- really an indictment of the breathless, 24-hour cable news cycle. "I just don't care," he said bluntly. This event really had only one unifying message -- tone it down -- but plenty of pressure to give it meaning.There was ample opportunity, much of it coming from the very media that Stewart routinely skewers: It was the Democrats' last-ditch effort for midterm momentum. It was the cry of liberals disappointed in President Obama. It was the left's answer to the Tea Party. A host of orgs, from those in favor of legalizing marijuana to those opposed to further engagement in Afghanistan, sought to seize the moment via peaceful demonstrations parading down the crowded streets around the Mall. Stewart, however, didn't display anything close to a desire to lead or hop on a movement. He didn't even take the bait when a reporter asked him whether people should vote. "I think people should do whatever moves them," Stewart said. Stephen Colbert downplayed the meaning even further: Those gathered "were there to have fun. They were there to play the game with us." Well before they arrived on the Mall, they knew what the game was. That was evident from the moment on Saturday morning that I stepped on a Metro train so full I feared a long exhale would trigger a breaking point. One woman, crunched against a window with her husband flanking her young toddler in a stroller, shouted, "Who's going to the rally?" Cheers erupted throughout the car. "That's too enthusiastic," she said. "You're supposed to be just kind of enthused." There were chuckles through the car. They got it. Off the train, through the Federal Triangle and toward Madison Drive on the Mall, an endless flow of signs provided a kind of ironic one-upsmanship: "God hates rallies." "Look outside the Fox." "Obama is a secret Christian." "Token pro pot sign." There was a sign portraying Colbert as Hitler, and others more apt to fly over people's heads: "Matt Damon wouldn't care if the president were a Muslim." One placard simply read, "Citation needed." Blatant appeals for candidates were few, and they didn't stand a chance of drawing attention. Karen Harshman, a retired school teacher from Hagerstown, Md., stood under a tree wearing a black lace hat with a toy tarantula on top and a sign that read, "We have nothing to fear but fear itself … and spiders." "I was hoping to show that spiders are dangerous, and that they are the only thing I fear," she deadpanned. A self-described Democrat, she came to the event with her husband, Mike, a Republican, because "I found both 'The Daily Show' and Colbert poke fun at politicians taking themselves too seriously. Just when they think they have done things right and perfectly, one (of the hosts) cuts them off at the knees." Stewart and Colbert "are on target," she added. "Even though it is satirical comedy, there is still a message. They bring it out, and it is that candor that is enjoyable." Mike Harshman said he is a fan of Colbert's in particular. He also wanted to go to Glenn Beck's Rally to Restore Honor, but could not make it that Saturday in August. That is not to say he is a fan of Beck's, too. He just wanted to see what it was all about. Beck "is a little weird," he said. "He is a little off the line as far as I am concerned." Among the swarm, there seemed to be few moments of mass movement, i.e. powerful chants or hymns. Parts of the crowd tried to stir shouts of "USA! USA! USA!," but they seemed to go nowhere. Near the stage, smatterings of rallygoers started to dance, but it didn't create a fever. There were certainly cheers and a few shouts for Stewart and Colbert and wild applause for some of their surprise musical guests, such as Yusuf Islam, the former Cat Stevens, and the O'Jays, but nothing that would make the Park Police nervous. The spirit of the event really was, "just kind of enthused." After it ended, spontaneous parades and protests broke out along the pedestrian-choked streets well into D.C.'s downtown. But thousands also stood for some time along the Mall, not ready to leave. Some were moved by what was said and done, but many also were doing what any tourist would do: Deciding what to do next. Amelia Copeland, 24, and three friends drove 22 hours from Oklahoma to be at the event. They planned to hit the bars before trekking back early Sunday. She was a bit disappointed that they couldn't get close enough to speakers on the Mall to drown out the noise of people chattering near them, but she was pleased. "I came for passion. Determination. Sanity," said Copeland, a paralegal from Norman. Her friend, Cati Harris, 25, a veterinarian technician from Enid, Okla., said she was "really impressed this many people turned out. "I get disillusioned in that I can turn on the TV and watch the news and think that everyone is right wing. But here I see that many people share my opinions, and that we all just need to chill the hell out." The early indications weren't too promising. Before the day was over, some on the right were saying Stewart sounded too "smug." From the left, Keith Olbermann quickly sent out a Tweet, "You can tone down all you want and the result will be: the Right will only get LOUDER. Sorry." Others were confused as to just what they should take away from it. Saturday night on the Metro, filling up with costumed Halloween partygoers, one college-age man said he tried to get to the rally but just couldn't get close enough to hear. He finally went to a bar to watch it unfold on TV. "I still don't know what that was all about," he said. Yet it stirred up something. This was a rally that spoofed rallies, but it was still a rally. Its goal of getting people to stop all the shouting may not get very far in the short term, but many, many thousands left confident that they get what so many comic professionals know: A little bit of satire can go a long way toward getting through the din. © Copyright 2010 , a division of Reed Elsevier Inc.
An error occurred on this page.